Tracy Brown chats with Rev. Charline Manuel about what it means to be Intentionally Inclusive as a spiritually guided person or leader. 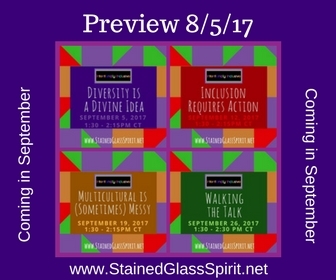 What is a Stained Glass Spirit Community? Now. Do it! Be inclusive. Click on image to register. It’s 2017 … and Stained Glass Spirit is ready to kick it into high gear. The INTENTIONALLY INCLUSIVE podcast is returning. There will be a minimum of one webinar a month. And a couple of virtual summits are being planned. In addition to information on the website, the best way to stay connected is via the Stained Glass Spirit Facebook Page. You can also receive email tips and webinar announcement via the newsletter. So stay tuned … 2017 is taking inclusion in spiritual communities to the next level!